The first location devised by the British Empire in colonial North America, the “Old Dominion” state today has one of the most praised and effective (based on research) state governments in the country. The U.S. Department of Defense and Central Intelligence Agency in Virginia have made the state a lauded location. The early 00’s brought on industrial change to the state, with computer chips at the forefront of the most lucrative exports for the state. The Byrd Road Act grants Virginia State Government dominion over state roads, versus other states which have counties control their respective roads. 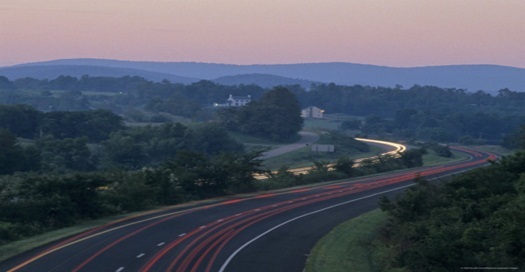 There are over 70,000 miles total of roadways in the state, placing Virginia at the third-largest overall highway system in the United States. With its sweeping shoreline, mineral springs, natural wonders and infamous blue-ridge mountains, Virginia is a majestic kind of place attracting millions of visitors each year. With many other industries as diverse as its landscape, Virginia's rich economy is coming back in full force and it's looking for good truck drivers to keep driving it forward. Bordered by the Atlantic Ocean, North Carolina, Tennessee, Kentucky, West Virginia, Maryland and the District of Columbia, Virginia's prime proximity to so many major US cities makes it a transportation hub with many products to export. With Tobacco remaining as its staple crop, the state also produces corn soybeans potatoes, cotton and apples. Virginia is also rich in wine production with poultry, dairy and cattle adding to its agriculture as well. Its coastal fisheries provide another source of industry, along with coal mining and manufacturing of rail transport equipment, chemicals, food and textiles. With the US Navy located in the state and government agencies employing many of its residents, Virginia has many industries to keep the state going strong. The U.S. Bureau of Labor Statistic last reported that the trucking industry provided 225,556 jobs in Virginia, or one of every 16 jobs in the state and this number only keeps getting higher. It was also reported that the average annual salary for the trucking industry in Virginia was $45,824. Not only is this much higher the national average income, but this number is also higher than the average annual salary for the trucking industry in other states. Now with the economy stronger and the demand for truck drivers growing stronger, the wages for Virginia truck drivers have the potential to be much higher as employers fight to attract and retain their employees. While the cities with the most jobs are Virginia Beach, Norfolk, and Chesapeake, Virginia has plenty of truck driver jobs all over the state and you don't need to be there to find them. All you need to do is go on-line and TruckDrivingJobs.com will give you access to all the best trucker jobs right from your home. You will find there are many different types of trucking jobs available and you need to determine which ones are best suited to your preferences and qualifications. Do you have a young family that requires you to be home at night? Or are you available and excited about the prospect of seeing all parts of the country and being on the road for a couple of weeks? From local deliveries, to long haul cross country to the various specialty endorsement qualified positions, Virginia has many positions available and its only a matter of finding the best one for you. TruckDrivingJobs.com will also help you with the next most important step of filling out our on-line application form, which immediately links you to hiring employers before anyone else. If you want a truck driving job in Virginia, TruckDrivingJobs.com will help you find the best one and help get you hired. Below are list of companies currently hiring within virginia. Call 540-722-8900Based out of Clear Brook, Valley Country Hams owns 965 trucks and primarily transports Meat. Call 703-548-5999Based out of Mineral, United Towing Service owns 551 trucks and primarily transports Car hauling, Reposession & Towing. Call 276-875-6526Based out of Honaker, C & R Gent Logging owns 113 trucks and primarily transports Logs, Poles, Beams, Lumber, LOGS. Call 540-334-5114Based out of Boonesmill, J & J Excavating & Hauling owns 699 trucks and primarily transports Livestock, SLUDGE. Call 540-933-6982Based out of Fort Valley, W C Transport owns 533 trucks and primarily transports regular Flatbed & Reefer loads, Fresh Produce, Livestock, Grain, Feed, Hay, Refrigerated Food. Call 804-969-4476Based out of Wingina, W E Jamerson Trucking owns 252 trucks and primarily transports Logs, Poles, Beams, Lumber. Call 540-236-2966Based out of Woodlawn, S & S Garage owns 165 trucks and primarily transports Car hauling, Building Materials, Grain, Feed, Hay, Farm Supplies. Call 540-674-1325Based out of Dublin, A & D owns 168 trucks and transports all kinds of freight. Call 540-468-2505Based out of Monterey, J & C Trucking owns 418 trucks and transports all kinds of freight. Call 757-242-9479Based out of Zuni, G E Bowser & Sons owns 107 trucks and primarily transports Building Materials, Construction equipment. Call 540-896-8812Based out of Fulks Run, D A D owns 628 trucks and primarily transports Dirt & Gravel/Dirt/Sand/flooring & asphalting supplies. Call 434-286-2705Based out of Scottsville, W E Ragland Trucking owns 655 trucks and primarily transports Logs, Poles, Beams, Lumber. Call 276-228-7891Based out of Max Meadows, A & A Trucking owns 203 trucks and transports all kinds of freight. Call 276-988-8110Based out of Tazewell, A & S Sanitation owns 144 trucks and primarily transports. Call 757-694-7460Based out of New Church, P L Bright Auto Recover owns 786 trucks and primarily transports Household Goods. Call 540-727-8918Based out of Culpepper, D & M Trucking owns 152 trucks and primarily transports regular Flatbed & Reefer loads, various metals such as Brass, Titanium, Copper, Iron, Building Materials, Machinery, Oversized loads such as Farm Mining or Oilfield equipment, Paper Products. Call 276-579-6118Based out of Mouth Of Wilson, B & R Construction owns 539 trucks and primarily transports various metals such as Brass, Titanium, Copper, Iron, Building Materials, Machinery, Oversized loads such as Farm Mining or Oilfield equipment, Construction equipment. Call 757-253-1500Based out of Williamsburg, S H Barner owns 141 trucks and primarily transports Building Materials, Construction equipment. Call 276-794-9091Based out of Lebanon, B & B Auto Sales owns 654 trucks and primarily transports Car hauling. Call 757-859-6268Based out of Ivor, Narvie Frank Britt Jr owns 586 trucks and primarily transports regular Flatbed & Reefer loads, various metals such as Brass, Titanium, Copper, Iron, Logs, Poles, Beams, Lumber, Building Materials, Grain, Feed, Hay, Dry Van, Paper Products, Farm Supplies. Call 870-673-1263Based out of Goshen, M & D Enterprises owns 652 trucks and transports all kinds of freight. Call 804-328-3500Based out of Sandston, Image Technologies owns 606 trucks and primarily transports Machinery, Oversized loads such as Farm Mining or Oilfield equipment. Call 540-636-4665Based out of Front Royal, J & M Carriers owns 175 trucks and primarily transports regular Flatbed & Reefer loads, various metals such as Brass, Titanium, Copper, Iron, Building Materials, Machinery, Oversized loads such as Farm Mining or Oilfield equipment, Fresh Produce, Oilfield Equipment, Grain, Feed, Hay, Meat, U.S. Mail, Dry Van, Refrigerated Food, Beverages, Paper Products, Farm Supplies, Construction equipment. Call 703-968-8273Based out of Faifax, K C C owns 945 trucks and primarily transports Machinery, Oversized loads such as Farm Mining or Oilfield equipment, Construction equipment. Call 276-755-3716Based out of Cana, B & R Masonry owns 293 trucks and primarily transports Building Materials, Machinery, Oversized loads such as Farm Mining or Oilfield equipment, Farm Supplies, Construction equipment. Call 434-432-9410Based out of Chatham, B & R Riddle Construction owns 293 trucks and transports all kinds of freight. Call 410-957-4643Based out of Accomac, A B Auditing Service owns 263 trucks and primarily transports regular Flatbed & Reefer loads, Logs, Poles, Beams, Lumber, Fresh Produce, Grain, Feed, Hay, Meat, Refrigerated Food, POULTRY. Call 540-344-7137Based out of Roanoke, C & P Welding & Steel Erection owns 199 trucks and primarily transports Construction equipment. Call 276-646-2004Based out of Chilhowie, C & A Fabricating owns 398 trucks and transports all kinds of freight. Call 540-433-4921Based out of Mt Crawford, A & J Development & Excavation owns 184 trucks and primarily transports Machinery, Oversized loads such as Farm Mining or Oilfield equipment, explosives for construction , Toxic Materials. Call 540-868-7695Based out of Stephens City, D & L Excavating Orporated owns 656 trucks and primarily transports Machinery, Oversized loads such as Farm Mining or Oilfield equipment. Call 540-992-2289Based out of Daleville, G C Woody Trucking owns 442 trucks and primarily transports regular Flatbed & Reefer loads, various metals such as Brass, Titanium, Copper, Iron, Logs, Poles, Beams, Lumber, Building Materials, Machinery, Oversized loads such as Farm Mining or Oilfield equipment, Fresh Produce, Meat, Dry Van, Refrigerated Food, Beverages, Paper Products, Farm Supplies, Water - Well. Call 276-523-3295Based out of Big Stone Gap, R & D Trucking Co owns 149 trucks and primarily transports Coal, Coke, Construction equipment. Call 434-349-1905Based out of Vernon Hill, B C Trucking owns 509 trucks and primarily transports regular Flatbed & Reefer loads, Logs, Poles, Beams, Lumber, Building Materials, Fresh Produce, Grain, Feed, Hay, Meat, Dry Van, Refrigerated Food, Paper Products, Farm Supplies. Call 703-451-3390Based out of Newington, L & A Tent Rentals owns 106 trucks and transports all kinds of freight. Call 540-752-8839Based out of Fredrericksburg, G & S Trucking owns 191 trucks and transports all kinds of freight. Call 434-248-5661Based out of Pamplin, A & H Haskins Transportation Services Lp owns 169 trucks and transports all kinds of freight. Call 804-435-9051Based out of Kilmarnock, M Lee & Son Transport owns 949 trucks and primarily transports regular Flatbed & Reefer loads, Refrigerated Food. Call 540-644-8188Based out of King George, B & B Enterprises owns 766 trucks and primarily transports various metals such as Brass, Titanium, Copper, Iron, Petroleum Gas & Natural Gas, Chemicals. Call 434-676-8253Based out of Kenbridge, Imperial Processing owns 136 trucks and primarily transports TOBACCO. Call 804-476-7441Based out of Halifax, B & K Transport owns 423 trucks and transports all kinds of freight. Call 540-762-5062Based out of St Paul, C & S Logging owns 833 trucks and primarily transports Logs, Poles, Beams, Lumber. Call 703-561-0077Based out of Herndon, G C Ross Trucking owns 639 trucks and primarily transports regular Flatbed & Reefer loads, Household Goods. Call 276-686-5453Based out of Rural Retreat, M & U Transport owns 248 trucks and primarily transports regular Flatbed & Reefer loads, various metals such as Brass, Titanium, Copper, Iron, Logs, Poles, Beams, Lumber, Building Materials, Machinery, Oversized loads such as Farm Mining or Oilfield equipment, Livestock, Grain, Feed, Hay, Farm Supplies, Construction equipment. Call 540-829-8688Based out of Culpeper, M & H Trucking owns 266 trucks and primarily transports regular Flatbed & Reefer loads, various metals such as Brass, Titanium, Copper, Iron, Logs, Poles, Beams, Lumber, Building Materials, Fresh Produce, Meat, Garbage, Refuse, Trash, Refrigerated Food, Construction equipment. Call 757-654-0041Based out of Newsoms, H M Mason Trucking owns 273 trucks and primarily transports regular Flatbed & Reefer loads, various metals such as Brass, Titanium, Copper, Iron, Building Materials, Grain, Feed, Hay, Chemicals, Paper Products. Call 540-456-6482Based out of Afton, E M Flowers Jr Trucking owns 710 trucks and transports all kinds of freight. Call 804-758-4536Based out of Glenns, J & J Satterly & Sons Transportation owns 106 trucks and primarily transports regular Flatbed & Reefer loads, Fresh Produce, Meat, Refrigerated Food. Call 540-788-1955Based out of Bealeton, L & M Carriers owns 935 trucks and primarily transports regular Flatbed & Reefer loads, various metals such as Brass, Titanium, Copper, Iron, Logs, Poles, Beams, Lumber, Building Materials, Machinery, Oversized loads such as Farm Mining or Oilfield equipment.